In Korea, 79 corporate insurance agencies are selling insurance through telemarketing (TM), and 20 of them use TM as their major sales channel. The rest rely on both TM and face-to-face marketing and have smaller sales forces with fewer than 100 employees. These TM agencies sell insurance policies provided by 26 insurance companies (14 life insurers and 12 non-life insurers), and a single agency represents 9.7 insurance companies on average. TM agencies accounted for 2 percent of the total new business counts for the first quarter of 2018. During the three months, they sold around 615,000 policies, up 7.7 percent compared to the same period a year earlier. As they focused on selling protection policies rather than large-premium savings insurance in preparation for the adoption of IFRS 17, their new business premiums declined by 5.9 percent year on year to KRW 20.7 billion in the first three months of this year. The amount is broken down into KRW 11.2 billion for life insurance and KRW 9.5 billion for non-life insurance. Close to 94 percent of the new business premiums came from protection policies whose premiums are relatively small, such as personal accident, cancer and driver protection covers. 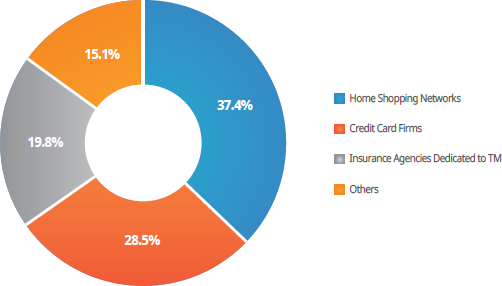 By distribution channel, home shopping networks made up the largest share (37.4 percent) of the total new business premiums for TM agencies, followed by credit card firms (28.5 percent) and insurance agencies dedicated to TM (19.8 percent). Home shopping channels rely on inbound telemarketing where customers are allowed to initiate the first point of contact with an insurance seller after watching an advertisement on TV about certain insurance products.